TRAVERSE CITY, Mich. — The auto industry seems to be roaring like a massive freight train into a neatly defined future — a brave and unmistakable new world of vehicle electrification, autonomous driving and shared mobility. At a gathering of executives and thought leaders here last week, auto execs sounded far from certain about this future thought to be so cool and clear-cut. Like a kid standing at the end of a high diving board for the first time as the crowd below coaxes him to jump: He knows he’s going to jump. He just wants to think about it for another minute. “When you’re running the company, you have to make decisions,” Don Walker, CEO of Magna International, North America’s largest auto supplier, told the audience at the Center for Automotive Research’s annual Management Briefing Seminars. Walker captured the complicated anxiousness of the moment. “If we went all in on electric vehicles,” he said hypothetically, “and we thought it was going to be 20 per cent penetration in 10 years, and it’s only eight per cent, then we’ve overcapitalized, and we quoted wrong. Implicit in Walker’s comment and echoed throughout the week: This is one of the most high-stakes moments in auto industry history. Automakers and their technology suppliers, along with bold new competitors from other industries, are conjuring up a radically different transportation world. Cars will detect crashes before they happen. Vehicles will be made of lightweight materials that present new manufacturing questions. Steering wheels will disappear into dashboards as cars speed along without human control. Vehicles will drive and park themselves. Cars no longer will have engines or transmissions. But unclear in August 2017 is how soon those things will occur. Will they happen to the degree the industry appears to believe? And if they happen as envisioned, who will play what role? The same week Magna's CEO was discussing the uncertainty of the industry's future, the company took its autonomous vehicle on an international trip. Walker and one of his competitors, Denso Corp. — the world’s fourth-largest auto supplier, which has operations in Canada — spoke last week of a need to look beyond the next four or five years. They want to look out 25 to 40 years. Denise Carlson, vice president of Denso’s North American Production Innovation Center in Southfield, Mich., told the gathering that Denso is contemplating 2050 in its planning — far beyond the uncertainties of this waning decade. And what it sees there, she said, is prompting Denso to transform into a company with a new focus on services, such as vehicle diagnostics. These have been heady times for the industry given the record light-vehicle sales of the past few years. Indeed, Michelle Krebs, a senior analyst with Autotrader attending the event, said the boom times are what have funded the industry transformation. And that’s one more reason companies suddenly may be feeling clammy — the sales outlook is darkening. Yes, the industry seems to be asking, but how? Amid last week’s conversation, right on cue, automakers reported July light-vehicle sales, and they were not rosy. U.S. sales fell 6.9 percent from a year earlier, the industry’s seventh-straight monthly decline. New-vehicle incentives rose 4.7 percent from a year earlier, according to an estimate from ALG. And sales of cars fell 15 percent. Against that backdrop, Mike Jackson, head of strategy and research for the Original Equipment Suppliers Association, which includes several Canadian suppliers, urged parts companies to be judicious about which vehicle programs they bid for in the next few years. Some will bring disappointment, he counselled. “You have limited resources,” he reminded the audience. “Scarcity, in terms of technical talent and financial resources. Where do you want to allocate those? Even the EPA signaled last week that it wants more information before it makes critical decisions. The agency is reviewing the 50.8 mpg corporate average fuel economy target for the 2025 model year that it set in January. Because Canada follows the majority of U.S. auto regulations, any changes to mileage would likely spill over into Canada. Christopher Grundler, director of the EPA’s Office of Transportation and Air Quality, told his audience here that the agency is seeking more data than ever to review the target. The EPA fuel economy target has been a prod for the past five years, pushing the industry to redesign parts, downsize engines, adopt electric powertrains, switch to new materials and rethink product portfolios. There is no certainty that the new EPA review will result in a lower target that eases the pressure on automakers. But to complete its review, Grundler said last week, it is asking for additional data from far corners. They include vehicle tear-downs and analyses of efficient new internal combustion engines, and even consumer feedback on how people feel about their cars and trucks. 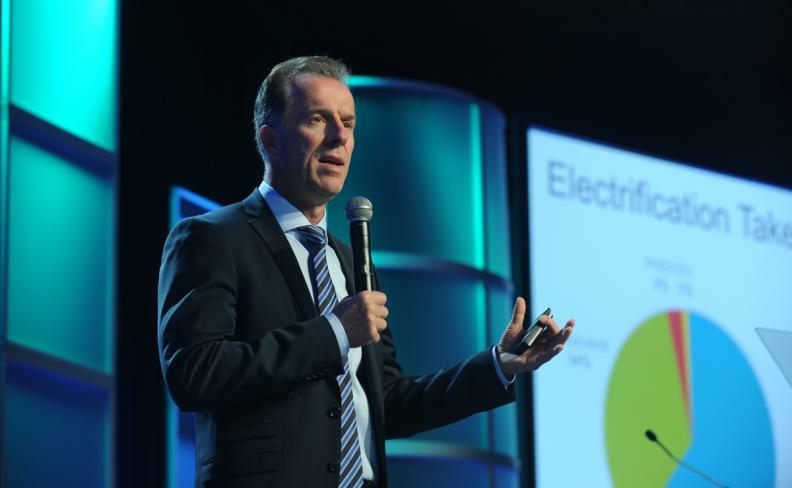 Robert Davis, senior vice president of special assignments for Mazda North American Operations, questioned the industry movement toward electrification. “The internal combustion engine has a strong future role in transportation,” Davis said. Eric Fedewa, senior manager of global market intelligence for Eaton Vehicle Group, agreed. While Magna expects its autonomous-related business to rise in the coming years, he said, the industry transformation will take longer than many seem to think. Some companies are telling the public that self-driving vehicles will be on the road by 2021. Walker predicted that as late as 2025, 17 percent of new vehicles sold will contain no autonomous technology, while another 79 percent will have only Level 1, 2 or 3 autonomous technology. Katie Burke, Michael Martinez, David Sedgwick, Richard Truett and Jack Walsworth contributed to this report.